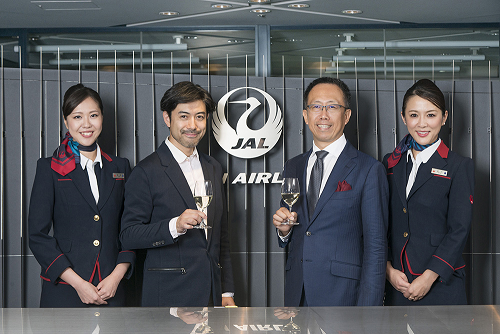 JAL appointed Motohiro Okoshi, Japan’s first professional wine taster, as JAL Wine Advisor in March 2016 to select wines and spirits served aboard JAL flights and in JAL international lounges at Narita and Haneda airports. With the support of Motohiro Okoshi and Kenichi Ohashi MW, who connects the world and Japan through wine and sake, we will contribute to cultivating a wine culture within Japan and boosting recognition of winemakers by introducing wines from around the world to Japan and wines produced in Japan to the rest of the world. Master of Wine (MW) is an international qualification created in 1953 by the London-based Institute of Masters of Wine. It is regarded as the most prestigious qualification in the wine industry. With a history of 60 years behind it, there are only 354 MWs in the world including two Japanese MWs, which is evidence of the high degree of difficulty in acquiring MW. Kenichi Ohashi is the only Japanese MW residing in Japan. This entry was posted in Airlines, Business, Food & Drinks, Travel, Travel Management, Travelers and tagged JAL Wine Advisor, Japan Airlines, Kenichi Ohashi MW, Motohiro Okoshi. Bookmark the permalink.